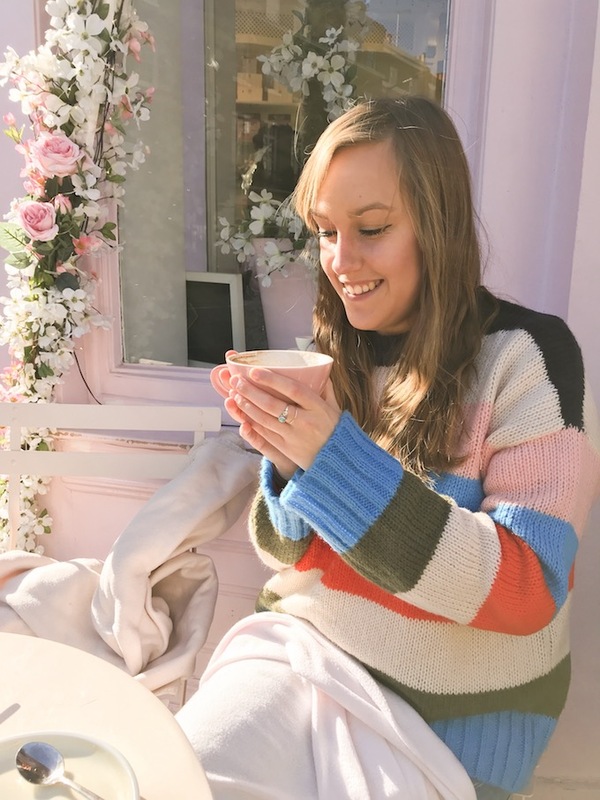 I finally did it, I hit the nail on the blogging head. I took the very cliché trip to Peggy's and what an experience. 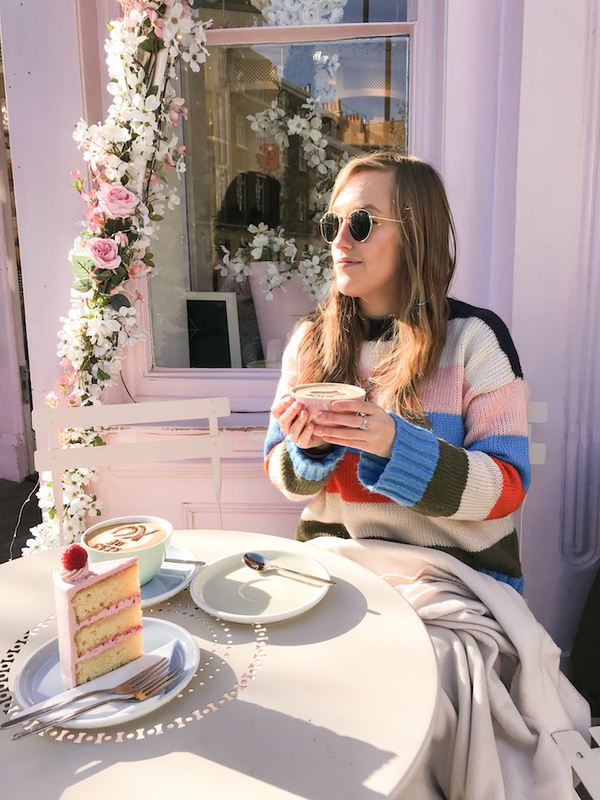 Firstly let's talk about the dreamy interior and the gorgeous cake. 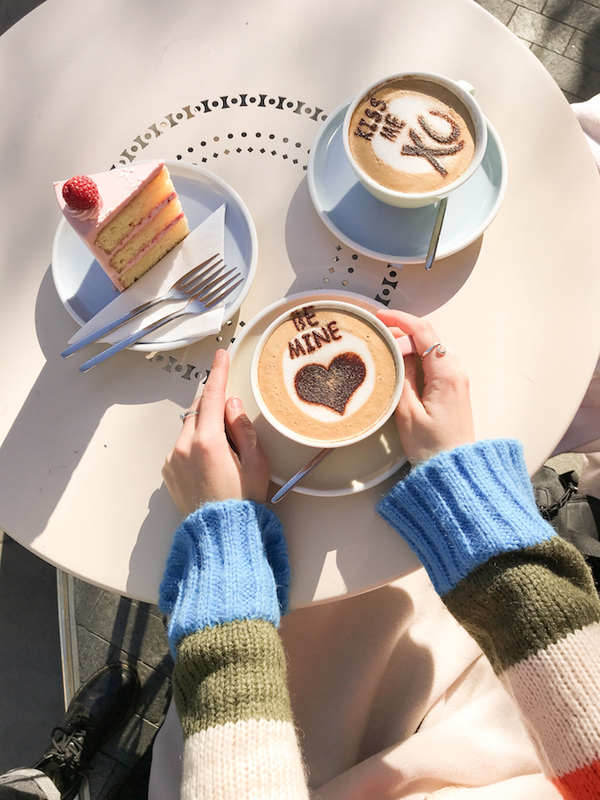 Not to mention the chocolate dusting on top of the coffees (we totally didn't order a cappuccino just for this) and the sun was shining what more could you want. Hannah and I jumped straight to taking photos while it was still quiet-ish but then a couple sat next to us. All they did was snigger, make jokes about getting 'the instagram' and all I wanted to do is turn round and make a comment about them. How they must really not be great people if they get a kick out of mocking other people for doing something we enjoy even if it makes us look a little silly. There were plenty of others just stopping buy to pose on the front steps rather than paying to actually try out the cakes and coffees. If they really have nothing nice to say why say anything (I'm not good at the whole anger thing) I mean why come to a place that you probably know a lot of people take photos of. Oh it really grinded my gears. 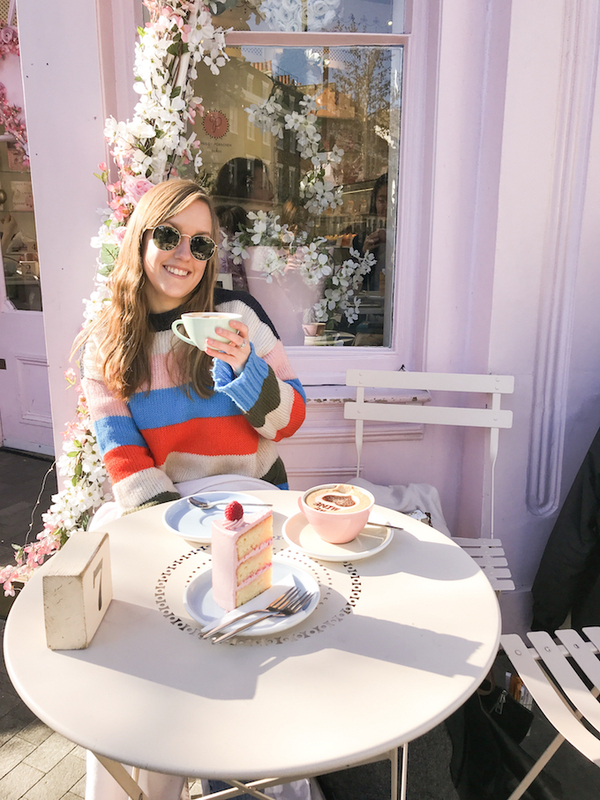 Instead I held my tongue, continued getting the photos I wanted (influenced by my blogging girl crush Isabella Thorsden) and enjoyed my cake. It was a very good raspberry, lemon and rose cake at that! And you're gonna wish you got photos to remember the beautiful place you mean couple you! Ok done, my bumberling rant finished. Do you see why I didn't turn around and say anything. It's a pretty all over the place rant and I would probably have blubbered and stumbled all over my words. Eurgh, I hate when people mock other people for things they enjoy doing. Who cares, let people do them and you focus on yourself ok. But do you know I had a swell time so I wasn't going to let it ruin my experiece an I am pretty darn happy with what I achieved in the photo department and it makes me happy. So you know You Do You! 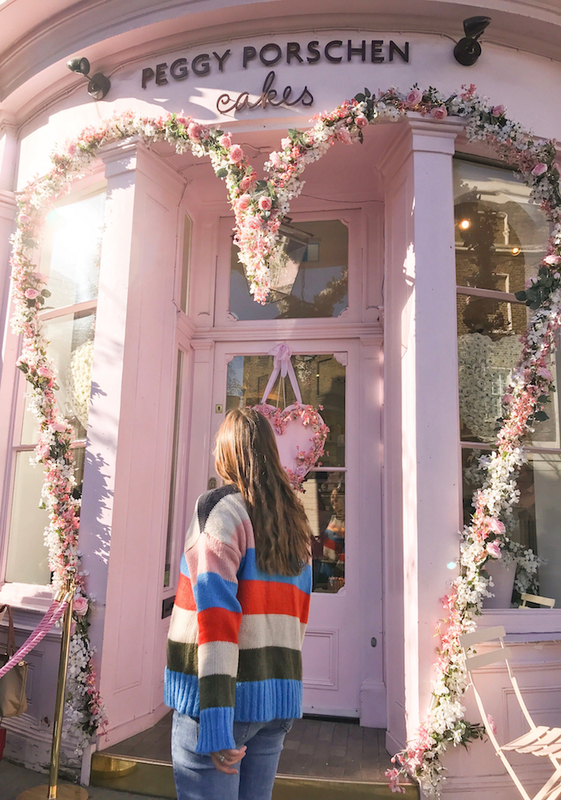 It feels strange to write a ranting post with such pink cutesy photos so if you can't be bothered to read the rant enjoy the pink and lots of it. Also i think this is the perfect time to mention the jumper. I am not usually one for colour, or multi colour looks anyway. You'd probably see me running in the other direction usually. But when I saw the first Urban Outfitters rainbow coloured jumper I was in awe and then this one came along. Hello gorgeous blue, powder pink and the vibrant orange! 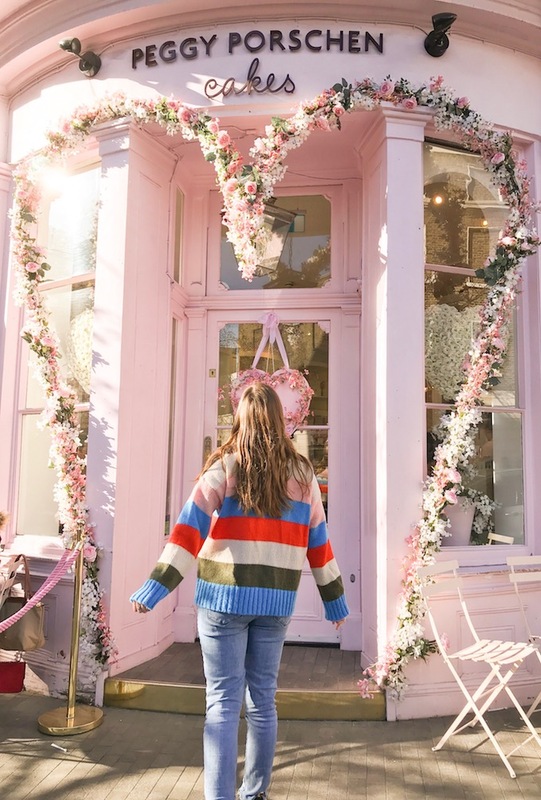 It's so beautiful and when I saw Isabella shooting with the rainbow jumper and it looking stunning I just really wanted to see what I call the muted down one looked like in front of flowers and pink pink and more pink. And I loved it. I wear this jumper all the time and for me, well I wasn't a colour gal and now I don't care. I tend to wear it with a black skirt and doctor martens but love it with the blue jeans too!